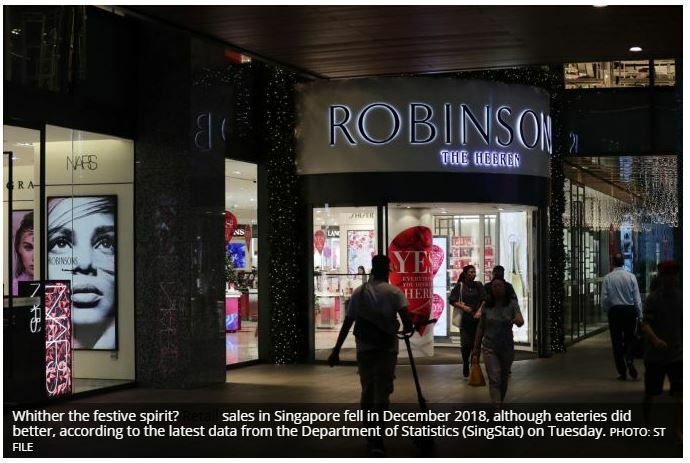 WHITHER the festive spirit?� Retail� sales in Singapore fell in December 2018, although eateries did better, according to the latest data from the Department of Statistics (SingStat) on Tuesday. The year-end slump pushed overall� retail� sales down by� 0.7 per cent for 2018, even though annual turnover ticked up by� 1.1 per cent when motor vehicles were left out. Takings were lower by 6 per cent in December� on the previous year, weighed down by motor vehicles and well below the median estimated decline of 3.6 per cent in a Bloomberg poll. Even with vehicles out of the picture, though,� retail� turnover was still down by 3 per cent. Altogether, stores rang up some S$4.3 billion in� retail� sales value, with about 5.5 per cent of that coming from online transactions. Auto sales, which were on a downtrend for 2018, dropped by 20.7 per cent on lower volume, while sales of computer and telecommunications equipment saw a slump of 16.8 per cent on the high base from major handset launches in the same period the year before. Medical goods and toiletries made up the only major� retail� segment to post higher year-on-year sales, inching up by 1.8 per cent. On a seasonally adjusted, monthly basis,� retail� sales slipped by 3.4 per cent in December 2018, or 4.1 per cent when motor vehicles were excluded. SingStat noted that department store sales slid by 15.7 per cent, compared with the month before, on the absence of Black Friday sales events. Watches and jewellery sales dropped by 9.7 per cent, furniture and household goods by 7.6 per cent and recreational equipment by 6.5 per cent. Full-year gainers included medical goods and toiletries (+4.8 per cent), furniture and household equipment (+3.5 per cent), clothing and footwear (+3.3 per cent) and food vendors (+2 per cent), while computers and telecoms equipment (-8.2 per cent) and supermarkets (-1.2 per cent) were among the losers. Petrol stations saw their annual takings up by� 8.1 per cent, in a year with a global oil recovery, although growth was a more modest� 1.3 per cent with the price effect factored in. Meanwhile, food and beverage services saw sales rise in� December� by 4.5 per cent year on year, to S$925 million, with growth felt across the board. Caterers reported the biggest rise, at 6.6 per cent, followed by fast food joints at 5.9 per cent, restaurants at 5 per cent and other eating places at 2.5 per cent. The sector saw a mild 0.6 per cent improvement on a monthly, seasonally adjusted basis. Food services receipts grew by 1.2 per cent year on year for 2018, driven by the� 7.1 per cent improvement seen at fast food outlets. Otherwise, caterers notched� 0.3 per cent gains, while sales at restaurants and other kinds of eateries improved by� 0.4 per cent.